The Uralla luxury tent at Sierra Escape, Mudgee. 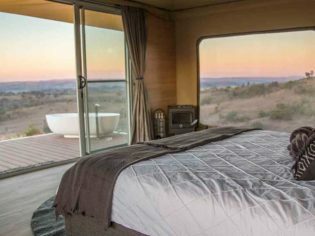 Just when you thought the world of glamping couldn’t get any better, Sierra Escape – Mudgee’s luxury eco site – expands. 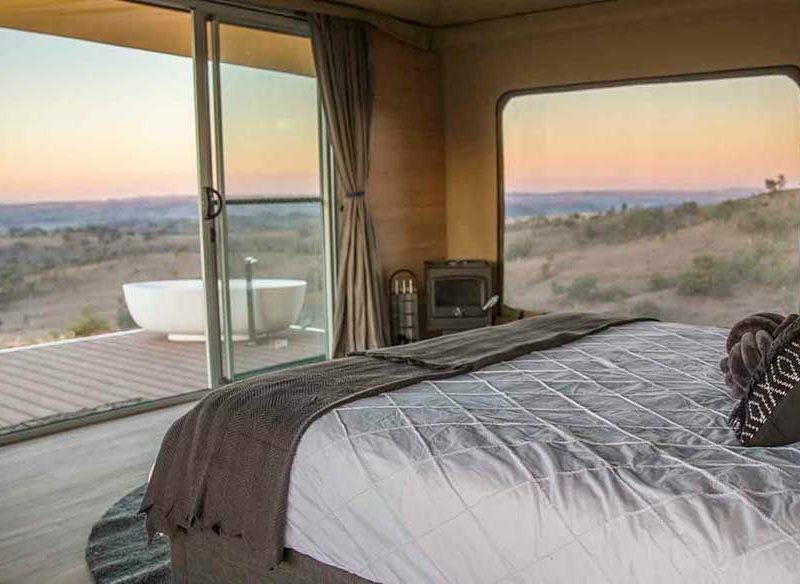 A stone’s throw from a town best known for its abundance of culinary experiences, Sierra Escape is the first and only glamping abode in the Mudgee region, and the ultimate destination for those who don’t like to check their comfort at the door. And with the recent addition of two new tents, glampers now have an even better opportunity to explore the 113 hectares of countryside waiting at its doorstep. Sierra’s proud stance as an eco-glamping site means it runs on solar power, and although all tents provide an outlet to charge laptops, cameras and mobile phones, straighteners and dryers have been left off the list of necessities (so get ready to embrace your natural hair). More importantly what it does offer is a cosy fireplace, fire-pit for marshmallow roasting, a small fridge, stove and free-standing bathtubs. If that’s not a good enough excuse to relax with a glass of Mudgee wine that we can’t stop raving about, then we don’t know what is! For keen foodies, Mudgee’s centre is less than 30 minutes away. Head to the Zin House for certified organic and biodynamic local fare, or if you’d prefer to stay by the tent, barbecues are on-site. If you’re looking for something a little different to add to your holiday, try a cultural foodie experience with Indigiearth – an experience where you can have bush tucker prepared for you at your tent. For the morning, Sierra offers both a breakfast and pantry pack including milk, tea, coffee, muesli, pancake mix and jams: perfect for breakfast in bed. The inside of the Dulli family tent at Sierra Escape, Mudgee. Accommodating up to seven people, if you’re looking at taking the family or a group of friends on a glamping adventure, the Dulili tent is the way to go. Ideal for entertaining and the perfect amount of space for all the kiddies (or buddies! ), the Dulili has two bedrooms; the first with two queen beds, a single trundle and the second with a double bed. Make like MasterChef and cook up a storm in its designer kitchen, serve your creations on either the indoor and outdoor dining tables or have the kids treat you to brekkie as you enjoy the views and secluded setting. The living room of the Dulli family tent at the Sierra Escape, Mudgee. The outside bath at the Urulla luxury tent at Sierra Escape, Mudgee. For those who want to take luxury glamping that step further, the Uralla is the ultimate choice. Sierra gets you started on your foodie indulgence with a complimentary bottle of local bubbles and chocolate waiting for you on arrival, and a yummy breakfast pack for Sunday morning sleep-ins. Boasting a large king bed, designer kitchen, fireplace and beautiful views from its prime position on top of the hill, Uralla is the perfect excuse to eat toasty marshmallows by the outdoor fire-pit or some wildlife watching in your indoor (or outdoor!) free-standing bath tub. Pricing is between $390–$650 per night depending on your choice of tent.